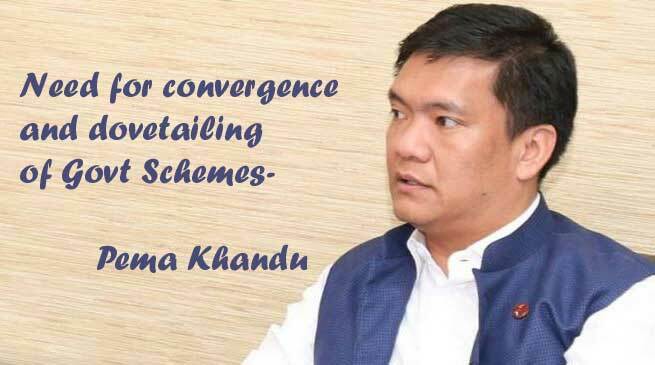 For successful implementation of schemes and projects at the ground level, Chief Minister Pema Khandu has stressed on the need for convergence and dovetailing of schemes, both central and state. There are many welfare and developmental schemes being implemented in the state – mostly funded by the central government and some by the state government – by respective departments independently as per their business allocations. With the lack of inter-departmental linkage, coordination and cooperation desired benefits of the schemes are not reaching the intended beneficiaries. “I am of the firm opinion that convergence of various schemes of the Central Sector Schemes (CSS) and dovetailing the same with State Govt Schemes will ensure much better result on the ground and at the beneficiary level. Presently, all departments are working in silos to the detriment of the State’s development,” he said. The Chief Minister requested the minister in-charges that a methodology on these lines may be adopted on schemes/projects being executed by their respective department(s) by encouraging inter-departmental consultations. “I feel that to have tangible & visible development on the ground and easy monitoring, such an approach would definitely prove beneficial,” he said while informing that a mechanism at the Officers level is being worked out by the Chief Secretary in this regard.